#SaveTheStudio is our current campaign in efforts to save our group from being evicted from the office that has housed our studio, darkroom, and weekly meetings for the last 50 years. As of right now, we will be forced to clear all of our equipment, belongings, and memories from this room at the end of May 2019. At the beginning of the Spring 2019 semester, we received notice from the office of Campus Center Management that we were to prepare to vacate our office in CC305 to be relocated, allowing two new University initiatives to be housed in the space. The initiatives, the student food pantry and Purple Threads (gently used professional clothing for students) are both two respected and appreciated programs for the UAlbany community with understandable space needs for storage. However, our “indisputable” relocation is ignoring the countless number of other vacant offices throughout the Campus Center building, including the large and more easily-accessible office that previously housed the Student Association prior to the Campus Center West Expansion in 2018. We were told that the Office of Campus Planning is responsible for this moving decision. We have met with two administrative members, Director of CC Management Karla Jaime-Benitez and Director for Student Activities Pamela Alexander twice now requesting that alternatives be considered allowing us to stay. The only alternative spaced we have been offered to permanently house our group is a 9x9ft room (above) the size of a large storage closet. CC Management has claimed they will try to hear our demands for space in another (still undecided) room, but has not yet considered allowing us to remind where we are. As a result of our relocation, we will be losing access to our darkroom, where students have been able to learn how to develop their own film since as early as the 1960s. Many of the photos that were first brought to light in this darkroom filled the pages of 5 decades worth of TORCH Yearbooks, visually documenting life on and off-campus through a unique student lens. 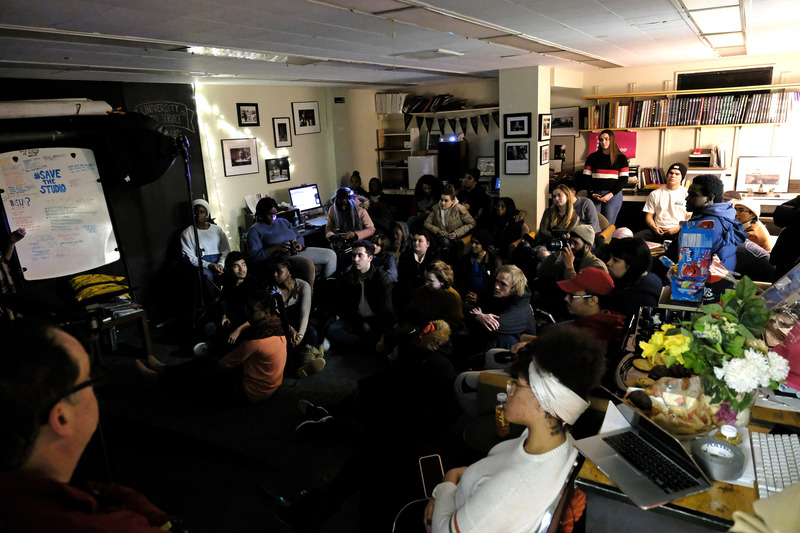 While TORCH’s last edition was printed in 2014, the current students of UPS have continued to document student life around Albany both digitally and on film. The administration’s stance is they they are not directly shutting us down, they are simply relocating us. What we need the administration to understand is that as a result of this relocation, our organization very well may die out. Not only because of our structural space demands and irreplaceable adaptations to our studio’s room, much like our darkroom, but also because of the high value of sentiment our office holds to all the members that have passed through for the last fifty years. The history of our room is what keeps many of our members so interested and continuously returning to our meetings each week. The quality of the work that is produced from our organization is the result of the experience we give each of our members,— a safe, very approachable and truthfully, very fun environment. Our room serves as a place to view the physical archives of photographed history on our campus and student life downtown, create strong relationships and bonds with students of similar interests and talents, and give access to a place providing skill development and experience using professional studio equipment and film development materials. These are opportunities that any student that is not academically committed to the art program at our school does not have access to anywhere else on this campus. The administration also expressed that the decision to relocate our group was determined by a lack of interest in maintaining our darkroom. Despite the resurgence in film photography and the expression of deep regret from other universities who have rid of their darkrooms prior to this popular revival, our University seems to think our space is simply outdated and of no need to keep operable. We are stressing for our protection so strongly because we need the administration to understand what will be the consequences of this move that very well may dissolve our group: a loss of our own history, the craft that has allowed us to document life on this campus so uniquely and through a student lens, and the very environment that has created relationships among our members who have maintained friendships decades after graduating. Many of these people, alumni who have reached out to us in the last few weeks, have expressed that they credit much of the development of their photography careers around the country and internationally, to their start with our group, the University Photo Service. To support us, consider sending a message to the University on our behalf, detailing your history/relationship with the University Photo Service and urging the administration to consider alternatives and allow us to stay. Also please consider signing our petition, which currently has over 800 signatures in support of our cause. THANK YOU to the number of people who have mobilized in this moment with us, donating darkroom & film equipment, cameras, and some thousands of dollars to our group. You have helped us highlight the community interest in protecting our organization during a university-wide trend of disadvantaging some of the most unique groups for students at UAlbany. @UALBANY, protect your own history. Don’t neglect the organization that has documented our student life for the last half-century. This loss will be felt by the creatives all throughout our community.